The Orlandini Company is a full service flooring company located in Waukesha, WI. 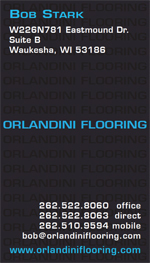 We were founded in 1949 in Menomonee Falls, WI, by Aldo Orlandini, an Italian immigrant. Today, our family business is run by Tom and Peter Orlandini,continuing the Old World craftsmanship and quality the Orlandini name has become known for. We have over 60 years in the industry, and are a Union company. We will cover all of Wisconsin, specializing in the lower half of the state. Have questions? 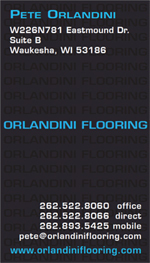 Click on the business card links below to email one of our flooring professionals.